I'd been wanting to try Kki for some time now. So when we were in the vicinity today, we made our way up Ann Siang Hill to take a peek at this quaint little cakeshop. We're glad we did because the stuff here is incredibly good. The Little Red Riding Hood (or LRRH, S$8.50) above gleams as it telepathically dares you to be the Big Bad Wolf. Well, you shouldn't hesitate. This 70% dark chocolate (and only Valrhona will do) mousse with raspberry centre was made to be devoured. Amazing how it is rich and dense, yet light and smooth at the same time. The "Kinabaru" (S$8) is clearly a play on Mount Kinabalu, the highest peak in this region. And "baru" means new in Malay, so perhaps a new take on something local? 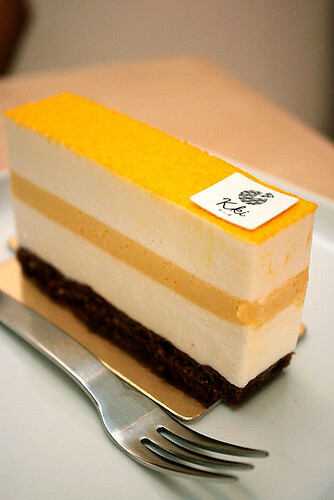 It's made of incredibly light coconut mousse and passionfruit creme. A wonderful pairing. I liked that both desserts were not drowned in sweetness, and this let the flavours really shine. I asked hubby which he liked better. He said both equally. The LRRH is like the striker, and the Kinabaru the midfielder. Yes, everything in life can be explained in soccer terms. Kki is really small. The cake display counter only holds about half a dozen types of cakes. 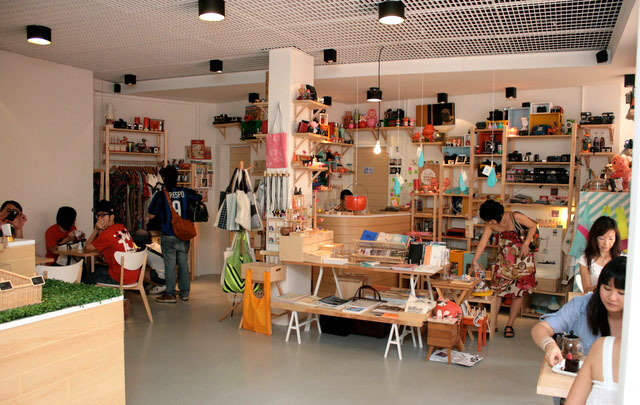 The rest of the shop space is shared with The Little Drom Store, a gift shop with lots of vintage and quirky eye candy. I love the cosy modern Japanese aesthetic of the place. 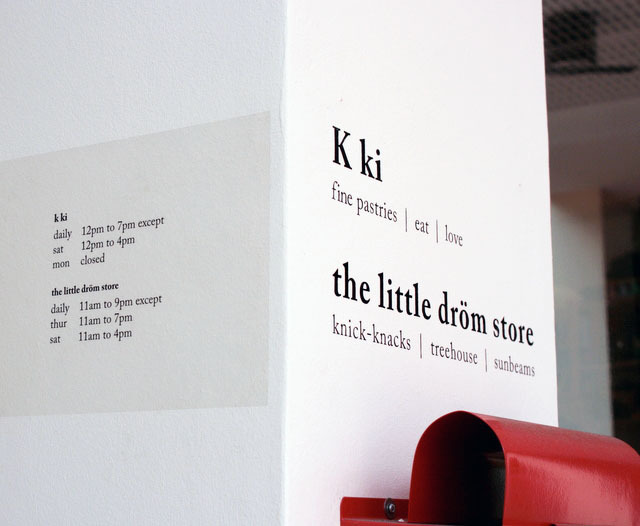 "Kki" is Japanese simplified for "cake". Something hubby and I are very familiar with and fond of. 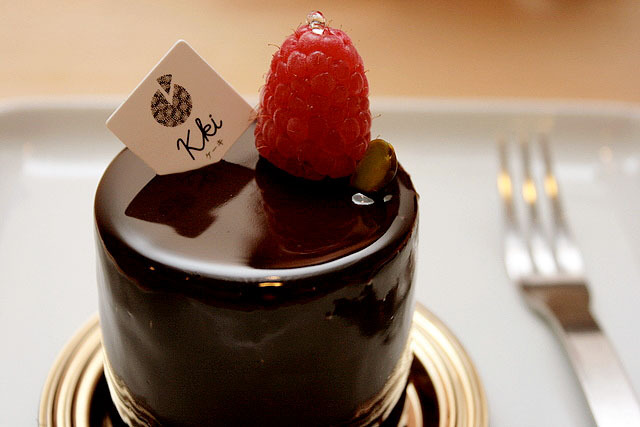 We always refer to cake in the Japanese way - "ke-ki" - as it seems to have better weight and emphasis than just "cake". Fine pastries | eat | love ? Well, there sure is a lot of eating in love, and love in eating. I like that. The husband and wife team behind Kki (he bakes, she serves) have clearly put a lot of loving effort into a small but excellent selection of cakes and pastries. I wanted to get some of those coconut sable cookies but they were all sold out. Oh, I'll just have to come back and what a good excuse that is. ooooo great pics Catherine! will take a walk there next week to try this! Oh very clean and minimalist. I like. I like this quaint little place with a cosy Japanese feel and light delicious cakes. Because of work I can only make it for Saturdays. Just went there yesterday. It's pretentious, the vintage stuff is very expensive and some dont event work, the lady boss is rude and unwelcoming. We were practically asked to leave the shop because according to her: "This is not a sit-down-and-eat place, it's takeaway"
So what the heck are the chairs and tables for?? Sheikh Najib Nasi Lemak - Supper with KF Seetoh! Camemberu is 3 Years Old!